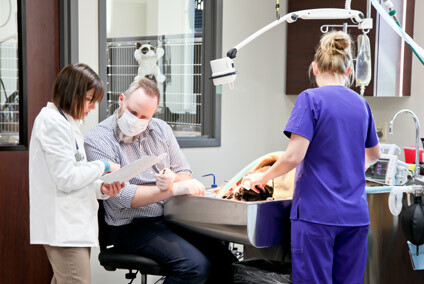 At Eagle Animal Hospital & Pet Resort, we provide care for all your pet’s needs—from snout to tail! That’s why we offer full-service dental care for pets and believe in the many health benefits it promotes. Although pet dental care may be something you don’t think about often when it comes to your pet’s well-being, dental disease can lead to serious systemic issues that may threaten your pet’s overall health. This can happen before symptoms are even noticeable and can be painful and inhibitive to proper nutrition. As a responsible pet owner, you never want your pet to suffer from any ailments, let alone something that is easily preventable with routine maintenance. At Eagle Animal Hospital & Pet Resort, we believe in partnering with you to ensure your beloved friend receives the best routine and preventative dental care possible. You can prevent serious dental problems by making sure your pet receives dental exams along with each vaccination or annually; however, good dental health begins at home. Checking your pet’s teeth regularly for signs of problems and brushing away any noticeable plaque buildup are the most important things you can do to maintain good oral health. If you are unsure how to brush your pet’s teeth, please ask a staff member for instructions. Call us to set up your free dental exam or to schedule your pet’s next dental procedure.